It was an ordinary November night in 1833 when, suddenly, the pitch-black sky (there was no electricity then) suddenly went ablaze with fire. All over the country, people rushed out of their homes, awakened either by the shouting in the streets or the light coming in through their windows, convinced that Armageddon was upon them. However, the reason for the fiery sky was not Doomsday, but meteors, as in thousands per second of them. This event would go down in history as the Great Leonid Storm of 1833 and this event would spur an intense study of meteors. Until the early 1800s, scientists weren't even sure of where meteors came from, with most believing that they were some kind of atmospheric phenomenon. By the time of the great Leonid Shower of 1833, a consensus was building that meteors did originate from space. 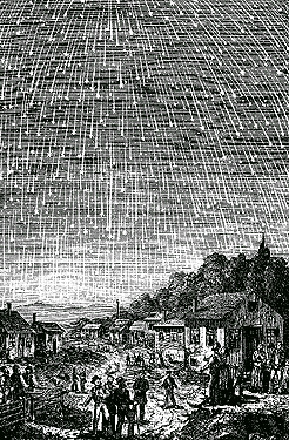 Taking the Leonids of 1833 as a start, scientists started reading old accounts of meteor showers. By looking back through the centuries, meteor showers were found to be not random, but regular in appearance. In regards to the Leonids, it was found that every 33-34 years brought a terrific storm far more intense than usual. By the 1860s (and the time just a few years ahead of the next forecast Leonid storm) it was confirmed that meteor showers came from comets. Right on schedule, the Leonids stormed in both 1866 and 1867. It seemed as though the meteor mystery was solved, but nature has a way of playing tricks. After the great storm of 1866 (1867 was nowhere near as strong, but, at over 1,000 meteors an hour, still a storm), the next Leonid storm was forecast for 1899. So, with predictions of shooting stars by the dozen per second being made, people all over the world went out to view the Leonids. They were disappointed, there was no storm that year nor the next, even the shower's parent comet, Tempel-Tuttle was not seen those years. What was going on? Proving that great discoveries in the area of orbital calculations were possible before the advent of computers, turn of the last century astronomers did some calculations of Comet Tempel-Tuttle's orbit and found that a close encounter with Jupiter had occurred in the years before the great Leonid disappointment of 1899-1900. Unfortunately, no one could say with certainty where the comet and its debris had gone, especially after the comet/shower failed to materialize yet again in 1932-33. In all, the great Leonid Shower seemed consigned to the pages of history..
Fast forward to the early 1960s. In 1961, the Leonids made a comeback. 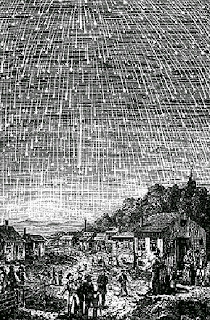 After years of meteor trickles, a shower came calling in 1961, with rates of around 50 meteors per hour being reported. Then, the astronomical community struck gold in 1965 when Comet Tempel-Tuttle, not seen in a century, was spotted. The next year brought a spectacular shower. During a short time span, meteor counts in the range of 40 per second were being reported in the Western United States. That translates to about 2,400 a minute or about 144,000 per hour. In summary, the Leonids of 1966 were the strongest since the legendary storm of 1833, but, unlike the earlier shower, were captured on camera. In the years that followed, the Leonids started to regain their strength, with storms materializing in 1998-99, 2001-2. Since then, the rates have slowed to around 20-30 meteors per hour on a good year. Unfortunately, for those people marking 2031 on their calendars, Comet Tempel-Tuttle will have another close encounter with Jupiter in 2028, which means that, chances are, the Leonids will be upset once again in their rhythm. And don't forget to check out my other website!